Well, he's right. That is what it means. — Inigo Montoya, The Princess Bride, on Vizzini's use of the word "inconceivable". Language evolves. Over time, as people speak a language, some of its words take on new meanings, and the old meanings may fall into disuse. Sometimes the new usages become mainstream; when was the last time you heard someone (who wasn't trying to be funny — and likely failing) use "gay" to mean anything other than "homosexual" or as a disparaging term?note (This usage of the word is better known by many as "ghey") Sometimes, things are more... contentious. This trope covers those words that writers, and indeed people in general, are frequently accused of misusing, although given the continual evolution of any spoken language, exactly what constitutes a "misuse" is hotly contested. The most common examples can be sorted into categories of varying pedantry. The more pedantic ones may rely on obscure usages or represent a vain attempt by linguistic purists to turn back the clock on the evolution of language (sometimes to a supposed past state that never actually existed), often accompanied by the belief that linguistic evolution is always "degradation." The usage may simply be so widespread that, while the "correct" usage is still valuable in some contexts, one can generally get away with the "incorrect" colloquial usage. The less pedantic ones, though, will probably elicit eye rolls at least from most people with an interest in language or a university education. Then there are some words that are just so specific that nobody actually bothers to look up what they really mean. This happens most often to scientific or medical terms. In some rare cases, the opposite may happen: a shorter word may be replaced by a longer one, either coined or borrowed, because the writer thinks using longer words makes his character (or himself) seem more intelligent. See "irregardless" (in the less pedantic subpage) for an example of pompous writers trying to create a word; compare Perfectly Cromulent Word. As an interesting aside, in his academic book Studies In Words, C. S. Lewis points out that this kind of meaning shift is very valuable to lexicographers who are trying to pinpoint a word's historical usage: A Grammar Nazi might say, for instance, "Immorality doesn't mean the same as lechery" because the word does often get (mis)used that way; they wouldn't say "Coalbox doesn't mean the same as hippopotamus" because nobody has ever confused those words. In other words, someone protesting that a word "does not mean X" is evidence that somebody else has been using it to mean X, which is what lexicographers look for. Conversely, someone may try to fudge a word's definition so that an example they dislike isn't what the word really means; that's the No True Scotsman fallacy. This isn't a general style guide; these are specifically words that have commonly contested usages. Homophones, humorous misspellings and bizarre malapropisms belong in The Big List of Booboos and Blunders or Rouge Angles of Satin. For errors of punctuation rather than usage, see Wanton Cruelty to the Common Comma. When this happens In-Universe because someone has an inflated estimation of their own vocabulary, it's Delusions of Eloquence or Malaproper. If it happens in a foreign language, it's My Hovercraft Is Full of Eels. When it's applied to tropes on this wiki, you get Square Peg, Round Trope. When someone insists on doing this even after the confusion is pointed out, they're using a Personal Dictionary. See also Godwin's Law for when "Nazi" is the word misapplied. You also might want to check out Said Bookism, as this crops when a word is used in place of "said" but the tone isn't appropriate for its use. Inconceivable, the word referred to in the page quote. It means that something is impossible even to imagine (or, depending on usage, to conceive in a biological sense, such as an inter-species crossbreed), although there is some variability to this. Anything that is truly and utterly inconceivable would by definition be unimaginable in any way, shape or form by our minds (including the mere concept), as they simply werent designed to conjure up such information. In any case, it does not mean "impossible", "highly unlikely", or "unfortunate". (It should be noted that this may not be a valid definition, but it's perfectly valid as hyperbole.) The closest synonym would probably be "incomprehensible". For example, a Man in Black scaling the Cliffs of Insanity after the rope he was climbing was dropped is unlikely, while scaling the cliff by himself without limbs or any equipment would be impossible. If the man wore, not black but, a color imperceptible to humans, that color would be, for the most part, inconceivable (the concept can be conceived but the realization cannot). It is impossible to give an example of something truly inconceivable since to do so would mean it is simultaneously possible and impossible to think of it. 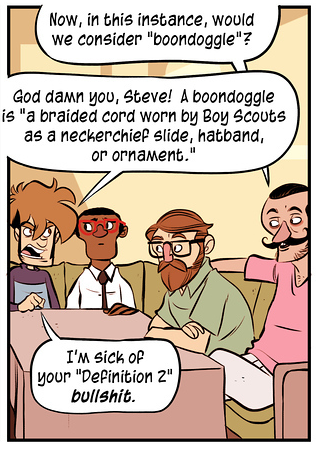 You keep using that word, I don't think it means what you've become accustomed to define it as.